Tonic is Giacinto Occhionero's third solo exhibition of paintings at the gallery. Five new works include naturalistic, neon, and metallic colors that cascade as particles in an imagined atmosphere. 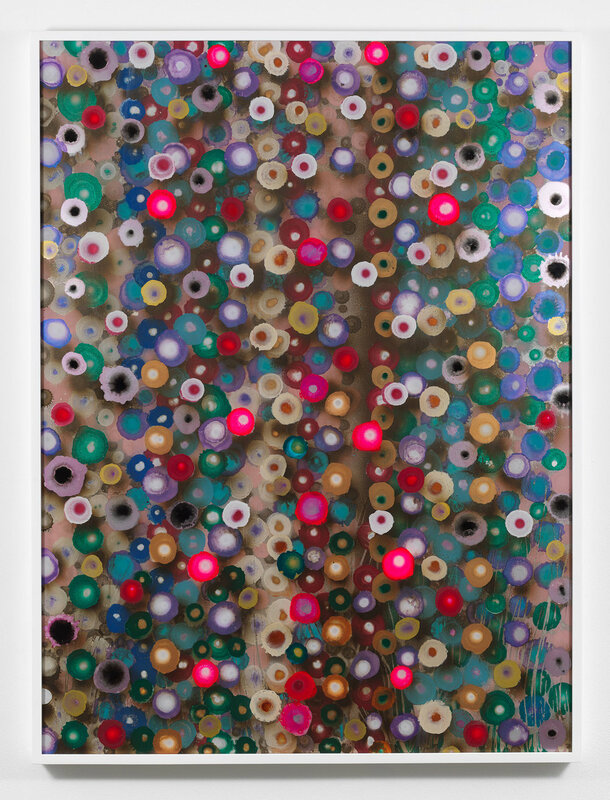 The works are executed in a process of reverse painting on plexiglass, a medium that has defined the artist's artistic research for more than a decade. A full color catalogue is available and includes an upbeat essay by Alan Jones, an American writer who, for several years, has frequented the company of artists in Italy. In Occhionero's new depictions, rips, fissures, and tiny holes appear as painted elements held back from the eye by a clear surface. The mediating device of plexiglass opens onto a compressed field of bursting energies. In contrast to his post-war Italian predecessors who searched beyond the surface of a monochromatic picture plane by burning it (Burri) or by puncturing and slicing through it (Fontana), Occhionero instead proposes rupture through depiction, eschewing the monochrome in a full-throttle embrace of color. Gothic stained glass windows, Marcel Duchamp's Large Glass... How did you go from canvas to a transparent surface? At a certain point I got rid of the canvas completely. My perfectionist attitude kept me from ever being altogether satisfied, because having the canvas to work on permitted you to impose additional elements. Backpainted plexi saturated itself with color and, when that happens, it's finished. Whereas in a traditional process of painting on canvas, the finished image conceals the very first marks placed onto the surface, in reverse painting onto a transparent support, the artist's first touches of paint are left on view. The final image is viewed from the surface's unpainted side, an 'underneath,' that brings the viewer closer to the painting's compositional foundation and further back from the materiality of the paint. Giacinto Occhionero lives and works in Rome, Italy. He was born in Campobasso in 1975 and attended the Accademia delle belle arti in Rome. His works have been exhibited at Kristen Lorello, NY, the Fondazione Sandretto Re Rebaudegno, Torino, Italy, and 68 Projects, Berlin, Germany, among other venues. Collections include the Capital Group, Los Angeles, CA, and the Collezione Banca Profilo, Milan, Italy, among others.